← Design Culture Salon 19: How does the design studio support emergent design practices? 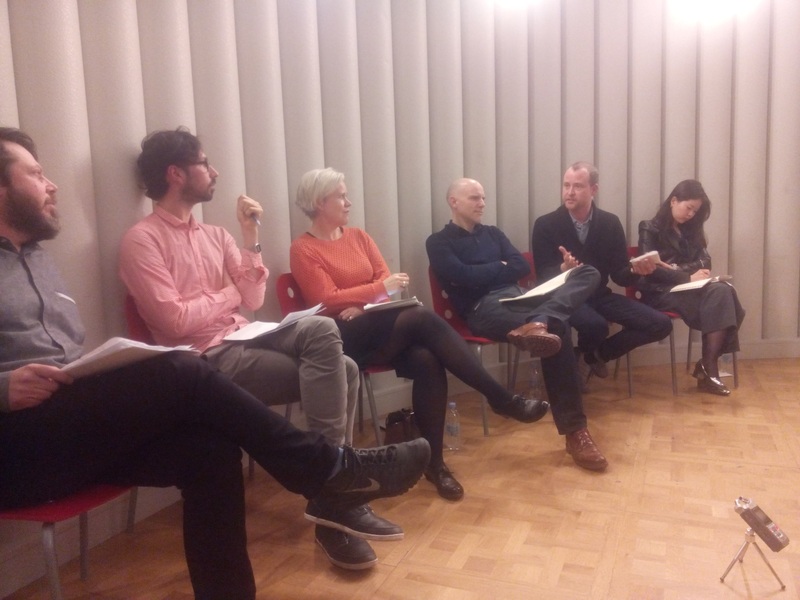 Reflections on Design Culture Salon 19: How does the design studio support emergent design practices? About 20 years ago, a group of undergraduate design students I was teaching in Leeds gave a presentation about their idea of the design studio of the future. It was relentlessly utopian in a kind of beachworld, surfer-dude way. They imagined the designer working out of a fancy campervan, travelling the planet, going to exotic places while maintaining their practice with global clients via the (then nascent) internet. Looking back, their forecast couldn’t have been wider of the mark. While there has been some flexibilisation of the geographical relationships between designers and clients, I would seriously contend that, at the same time, the struggle for space has become all the more urgent. By this, I mean being able to pay the rent on a studio, but also configuring oneself into the ‘right’ topographical networks to support professional practice. This may include insisting on being among the creative milieu (London’s Shoreditch, Hong Kong’s West Kowloon, Manchester’s Northern Quarter and so on) and/or being close to your potential clients (see Reimer et al 2008 on this). Whatever the priority, the key issue is that space isn’t going away (see Massey 2005 on this). Design is not getting deterritorialized. And, as we found out later in this Salon, understanding what goes on in those studio places is getting more complex and varied. Chair: Dr Lucy Kimbell, Director of Innovations and Insights Hub, University of Arts, London. Dr Ignacio Farias, Assistant Professor at the Munich Center for Technology in Society and the Department of Architecture of the Technishe Universität München. Kicking off the evening’s debate, our guest chair, Lucy Kimbell noted two current vectors in design that may be effecting how we conceive of the studio. The first is in the intensification of designerly approaches. This is where, for example, design is beginning to be found in new locations and conjunctions. One of these that Lucy Kimbell has been closely involved in has been in the use of design methods in policymaking, specifically in the UK Cabinet Office PolicyLab. The second vector has been in a ‘de-intensification’ (or is that ‘extensification’?) of design. Examples here would include the rolling out of design toolboxes such as the Nesta DIY Toolbox or in OpenIdeo. Thus, on the one hand, more precise design methods are under increasing exploration for specific circumstances while, on the other, access to more generalized and schematized ways of designing are being provided to a wider set of actors. In either case, and many others, the places where design is being undertaken are becoming more varied. This in turn has ramifications for what we think the design studio might be like. Daniel Charny followed on by pursuing what the studio means. He made a case for it as a comfort zone – somewhere where, at its centre, material experimentation and new thought processes can take place that are core to design work. That said, design studios have become less private. This is partly to do with digital networks that in various ways give access of different sorts to the studio both to clients and a wider public. In the former case, things like Skyping allow quicker and iterative interchange of ideas between client and designer. In the latter case, designers’ websites are more likely to show design at work. [Elsewhere I have argued that this becomes performative. Citing examples, I have argued that client visits to the studio sometimes involve the self-conscious showing and playing-out of ‘creativity’ (after all, this is what the client is buying).] Equally, studios have increasingly become shared environments with several individual designers or set-ups sharing resources. This is, not least, a result of the rising cost of studio space. Ultimately, Daniel Charny made a case for the studio culture rather than the studio environment as being the most important. Alex Wilkie was asked about Studio Studies: Operations, Topologies and Displacements, edited by Ignacio Farías and him, that they were launching. Why write it now? Alex Wilkie explained that in the disciplinary field of Science and Technologies Studies there has been close examination of the science laboratory. In particular, this has been carried out by Karin Knorr Cetina. Here, the focus has been on the lab as an inscription device: its material and social configuration produces certain forms of laboratory practice, and therefore outcomes. However, STS and then social and cultural theory have, in Alex’s opinion, completely ignored the studio. Perhaps the only exception to this has been Donald Schön’s 1985 book The Design Studio. This was produced as a commission by the Royal Institute of British Architects and focused on architectural practice rather than design. Further, in its framing it continued to reproduce certain well-known ‘master (masculine) – apprentice’ power relations. [I would, however, highly recommend AnneMarie Dorland’s excellent essay on routinization in the design studio in Design and Creativity that Liz Moor and I edited in 2009. (Apologies for the blatant boosterism here.)] So, it is time we thought more deeply about how the design studio functions as an inscription device. Peter Lloyd picked up on the traditional power relationships of ‘master-apprentice’ that goes on in studio culture. Even when it’s all meant to be very open and participatory – when the Post-It notes start to fly – there is still someone in charge of the process. Aside from this tradition, Peter Lloyd focused on the role of language in explaining or obfuscating studio practice. Thus he talked about the painter George Shaw, recalling a phrase written about his work, ‘he imbues his meticulous records with a melancholy nostalgia’. Peter asked whether this is really what Shaw was doing at the point of creation or, even, whether this was actually possible! The record of the studio in action is always imprecise and the issue is to focus, as Alex Wilkie had also argued, on what was actually happening there, not on what people says happens. You can read more of Peter’s thoughts on this in his own blog. Yiyun Kang reflected eloquently on her experience of working in digital arts and design. As a V&A Artist in Residence, her work has involved digital projection mapping, interacting, in particular, with the museum’s cast courts. The ‘performance’ of the work itself is in adding layers of light to pre-existing objects. In this, and much of her other creative practice, she is working in site-specific ways and so, for example, the V&A itself becomes the bigger studio to her work. In more conventional terms, for Yiyun Kang, the traditional studio may be important as a site of exploration but, importantly, it also functions as the place of documentation. Her work is very spatial and ephemeral and thus the studio becomes the place where the outcomes and processes of her work are archived and analyzed. This is an important point in that it reminds us that studios fulfill multiple roles. Many of these roles go beyond the straightforward conception of the studio as a cradle of creative outputs. Studios do other things as well. Ignacio Farías pushed this discussion of creative work taking place beyond the studio. He spoke of the experience of creating a kind of nomadic studio with the artist Mirja Busch. Even on a road trip, the issue of storage became a central challenge. They found themselves increasingly ‘living off the land’, drawing from resources they discovered through the journey rather than what they had brought with them. The gear they were carting around seemed increasingly irrelevant to what they were doing and yet they still felt the need for it to be there. Wherever the studio takes place – even if it doesn’t exist in the traditional four walls – it is subject to various contingencies. It is a place of happening. Later, Ignacio Farías reinforced this by stating that this doesn’t necessarily mean that this kicks notions of exploration and creative freedom out the window. The studio — and all its social and material knick-knackery — can provide the conditions for these. It’s just that every practice comes with a particular world. This means that a designer is working on something, but is also working on the conditions that make that working at the same time. The multiple reference points for what really is a design studio unfolded through the evening’s discussion. It’s difficult to keep up with and, I would forcefully add, impossible to make overarching generalizations about what the design studio might be or, indeed, what studio culture may involve. A bunch of us at the V&A are getting increasingly interested in what’s happening in Shenzen in China. Salon regulars, Daniel Charny, Cat Rossi, myself and others will be taking the Design Culture Salon to Shenzen in March 2016 to build dialogue with practitioners, commentators and entrepreneurs there. It seems that there are some fascinating developments going on. Design, in that traditional consultant form exists but much more embedded and complex relationships with manufacture and making are also at work. Watch this space. The intensification and de-intensification of design involves new spatial arrangements. But I won’t be expecting the imagined, globe-trotting surfer-dude designer to become a significant actor in any of this. Arguably, much of design is far too weighty and material, rough-edged and friction-dependent, people-centric and social practice-oriented to ever be deterritorialized. The reality of the design studio in all its manifestations has a long way to go. This entry was posted in design practice, publics. Bookmark the permalink. 1 Response to Reflections on Design Culture Salon 19: How does the design studio support emergent design practices?